Yet again another treat for me. I have never seen this film going into it. Had no knowledge of what it was about other than starring the wonderful and great Robin Williams. As I have stated many times before I love going into films with no knowledge of them or any idea what they are about. Kind of like a blank slate ready to be filled with information and ideas. Seeing this is both fun and yet tear inducing. Tear inducing because of seeing Robin Williams. It saddens me every time I see him now, all I can think of, is how he killed himself. It so destroys me thinking this great worthy to praise genius ended it all. Depression is a horrible destroyer. Robin Williams was an actor that graced the beauty of cinema in so many ways. Not only as a true comical wonderment of film, but also as a true dramatic thought provoking star. He could capture the funny bone, with Mrs. Doubtfire, or The Birdcage to the heart strings of Dead Poets Society and Good Will Hunting. No matter what he did, he aced it in total clarity of performance. It’s sad now watching his films, although I am truly thankful that his films exist, so that one can return to them over and over, and thankfully companies like Twilight Time Blu-ray is honoring this acting master with this lovely Special Edition Blu-ray. 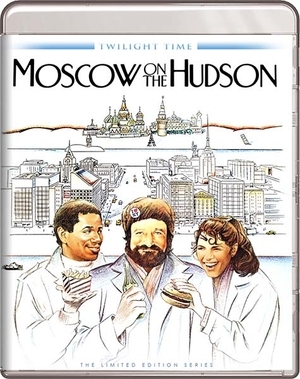 Moscow on the Hudson can be classified as a romantic comedy with a little slice of drama. The story is of comical means. Robin Williams plays Vladimir Ivanov who is a saxophonist with the Moscow Circus. Now the film is set in the early 80’s during the Cold War days. The Circus performs in New York City. While there Vladimir decides to defect, denouncing Russia. Giving up the allegiance of his home country and claiming America. So, begins a wild and interesting ordeal with comical overtones and classic Robin Williams banter. Also, starring the very beautiful Maria Conchita Alonso who has been acting since the late 70's, and is still going strong today. Her beauty can’t be put into simple words. Her ability at performing is a golden ticket of perfection no matter how small her part, she aces it. My eyes first caught her beauty and ability to perform in the odd sci-fi flick 1987’s The Running Man. Also, her wonderment in 1988’s Colors, and in 1990’s Predator 2. From TV to feature film, she gives it her all in no matter what role she controls. In 2007 she shinned in the TV series Saints & Sinners. But I really loved seeing her in the part of Alice Matthias in one of my favorite horror films, the very underrated and sadly not appreciated, 2012’s The Lords of Salem. Her beauty and her acting ability defines her stardom in excellent award worthy performances. She is one of the greats of cinema that sadly is often overlooked, or never given the limelight she deserves. She is a true Golden Ticket of cinema. It was great seeing her in this film. Also, starring an actor who I have always felt never got the push, or limelight he deserves, the wonderful Cleavant Derricks. Many TV watchers and sci-fi buffs will know him as the character Rembrandt Brown on the long running TV series, Sliders. Been acting since the late 70’s and as of this writing his last acting was in 2011. He is one of those performers that can own a character no matter if it’s Television or Feature Film. He graces the screen both big and small with a total understanding of the parts he plays and executes those characters in a reality that the viewer accepts them as real, or understands them. I have to give an ultimate shout out to him, because he is from my home state, and my home city, Knoxville Tennessee. Also, keep an eye out for Alejandro Rey, who is a great actor. Started performing in 1953 and did so up until 1986. Sadly, passing away at the young age of 57, way too soon, nasty lung cancer. He was a performer in cinema that you always knew, or always where like “oh yeah it has him in it.” From TV to feature film he did it all. From lower budget, to higher budget. Many old timers will know him from The Flying Nun TV series playing Carlos Ramirez. I'll personally always remember him in 1980’s masterpiece of psychological insanity and total filmed mastery, The Ninth Configuration. Also, keep an eye out for another underrated actor Elya Baskin. Another amazing performer that never gets the just due of stardom. Playing minor parts, or side characters, or thought provoking bad guys in TV and feature film. Always a treat to see. I always remember him from the character of Anatoly in the Sci-fi feature film 1984’s, 2010: The Year We Make Contact. He was wonderful in Moscow on the Hudson. This was created by actor, writer, producer and director Paul Mazursky. To be honest I had no idea he did so much. I knew he was the director for Down and Out in Beverly Hills and that is about all I remembered him for, so I was kind of shocked after researching a little that he directed 19 films. Really shocked by that. He was more of an actor than director. Started acting in 1953 and did so until his death in 2011. It’s amazing the stuff you find out while looking up a film. Twilight Time has done it again in bringing out a wonderful film, both funny and entertaining. Twilight Time always gives fantastic care, and love for the pieces they choose for these 3,000 Unit special edition Blu-rays. Yet again an amazing transfer to 1080p High Definition. I have never seen this before and seeing it now on this beautiful Blu-ray, it’s perfection. Aced it as always. 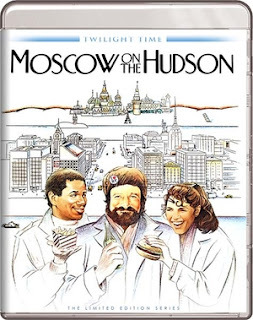 Twilight Time gives such amazing care to their releases and Moscow on the Hudson is no different. The imagery is vibrant and crisp. The audio is spot on clarity. A perfect example of how to treat cinema. Loved it. Isolated Score Track: David McHugh is a wonderful musician. A very talented musician. His skills and clarity in capturing the sounds and tunes needed to further a film is spot on. Something I have always stated is music defines a film and can also create the memorable reality of that film, Hint: Psycho need I say more. Music is a golden ticket when it comes to film. Music can create or destroy a film. Music must fit inside that movie and the music by David McHugh does that with a crystal clarity of sound beauty. His music has been used on many films. His mastery at his talent shines in Moscow on the Hudson. His other music for films is one of my personal favorite’s, 1989’s The Dream Team. Also, what I think makes Hugh stand out, he is so many talented person’s in one. From music, to poet, writer, to creating furniture and photography, and on an interesting note, he is a United Stated Patent inventor. He is also a teacher. He is an all-around guru of creation. It was great hearing this special feature. Audio Commentary with Film Historians Julie Kirgo and Nick Redman. Priceless. It’s never a dull moment when two awesome and amazing film historians come together and teach and express the wonder of a film. Both Julia Kirgo and Nick Redman are perfect gurus of cinema knowledge and love for film. They both give passionate lessons to the watcher and film lover. Audio Commentary with Director Paul Mazursky. It’s always great hearing from the creator of a film. This was an interesting listen. This is an older commentary. Sadly, Paul passed away in 2014, but thankfully recordings like this exist so that film lovers can look back and listen to those who created the film, and get a personal knowledge of what a director and writer was thinking. Paul also has a cameo in the film as the character Dave. Yet again all I can say is fantastic. Twilight Time Special Edition 3,000 Unit masteries are always a constant treat to be entertained by. Wonderful seeing this for the first time. Loved and yet heartbroken seeing Robin Williams. A fantastic transfer to High Definition. Amazing audio and video. A few wonderful extras. Solid designed wrap around artwork. A beautiful booklet insert. A high quality, must own, must experience Blu-ray that only Twilight Time can fathom.